In November, I started my new job working as Environment and Conservation Officer for Tristan da Cunha Government. 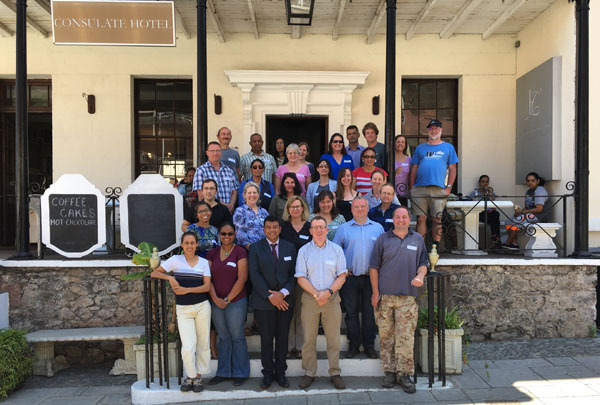 In the second week, I went to St. Helena to attend a UK government-funded workshop organized with the GB Non-Native Species Secretariat and Centre for Ecology and Hydrology. The UK and international experts worked in teams to identify non-native plant and animal species that could impact the economy, human health, and ecosystems of the Mid-Atlantic UK Overseas Territories. Delegates assemble outside Jamestown's famous Consulate Hotel. Stephanie is on the back row with bright blue top and sunglasses. 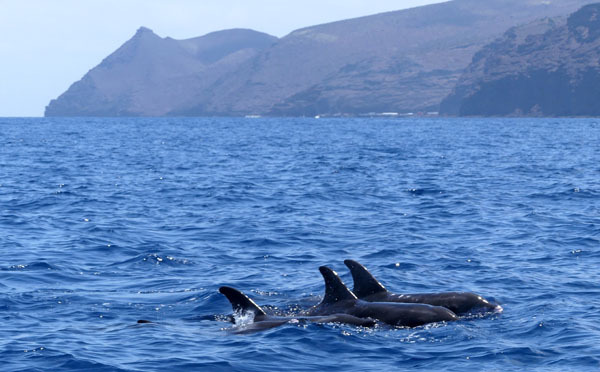 The teams developed lists of potential plants, animals, invertebrates and marine species that could arrive, establish and impact the Tristan da Cunha archipelago in the next ten years. It was impressive to see how hard these experts, who have never been to Tristan, worked in creating these lists. Administrator Sean Burns was part of the meeting during a phone call to Tristan. Then we came up with an overall index of species along with a pathway action plan for biosecurity planning. Our return flight was delayed twice so we had the chance to see Biosecurity in Action as the cargo ship offloaded supplies. It was a great opportunity to work with the head biosecurity officer Julie Balchin and others to see what things they look for when processing cargo. We also had a chance to explore the island a bit and enjoy the warm Saint hospitality. 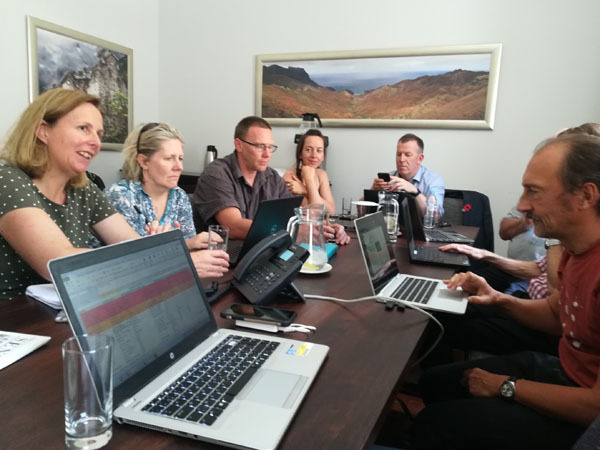 We will continue to work with Jill Key, who is the Overseas Territories Project Manager from the GB Non-native Species Secretariat, to add to these pathway plans for Biosecurity for Tristan da Cunha. and, as a little studied cetacean, maybe it already has, but never recorded.